Style Inspirer ENFPs draw others into their world of big ideas and outside-the-square thinking through their inspiring idealism. They capture our imaginations with their enchanting style strengths. Curious about many things, when it comes to style Style Inspirer ENFPs may wish to know what the style rules are… but they’ll want the freedom to press against them, turn them upside down, try them inside out, and only take what they want – leaving the rest behind. This penchant for experimenting gives them a great sense of personal freedom in how they develop their style and build their wardrobes. 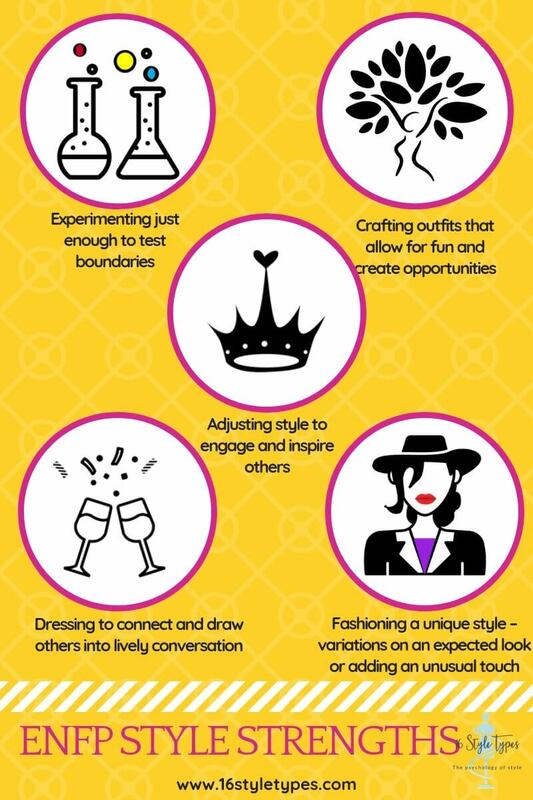 Vibrant and sociable, Style Inspirer ENFPs enjoy being around people, sharing ideas, listening and being listened to, and seeing what emerges from all that wonderful activity. Possibilities focused, their style can have a constantly emerging feel to it, and they are expert at tailoring their look to more closely align with the people and projects they’re connecting with. Like other NF style types, uniqueness is important to the Style Inspirer ENFP. She wants to feel like she’s being noticed for who she is, not being categorized too quickly or dismissed. 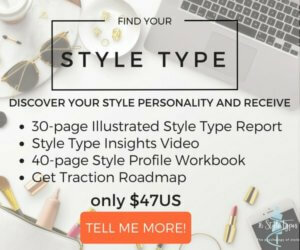 Visionary and inspiring, you’d be hard-pressed to ignore a Style Inspirer ENFP in any room, and the conscious ENFP knows this – and uses her style wisely. She’ll ramp it up to amplify and draw even more attention to herself (well, her ideas to be more accurate about it) if that is required, or she’ll tone it down so she doesn’t overwhelm those she’s trying to connect with. It’s all part of the charismatic approach Style Inspirer ENFPs bring to their world. There’s a sparkling ingenuity to Style Inspirer ENFPs. You can honestly feel like anything may happen around them. Our ENFP interviewee told us how she likes to shake things up when out and about with friends – they’ll go into a store and she’ll set them a challenge such as finding the ugliest item of clothing in the store and fashioning an attractive out of it. Who thinks of such things? Style Inspirer ENFPs, of course!